Safeguarding machinery is a critical step in all industries from manufacturing to machine building to packaging for ensuring smooth operation and a safe environment. Safety light curtains and safety laser scanners are two devices commonly associated with safeguarding of an industrial facility. Both can be used for a variety of safety applications such as point-of-operation guarding, area guarding, entry/exit guarding and perimeter protection. But how does one choose the right tool for the right problem? A safety professional would be your best bet; however, you can follow a list of considerations to guide your way through this decision. A point-of-operation is the area around the machine where work is performed. In order to make sure points of operation are protected, the person’s proximity to the hazardous point is detected. 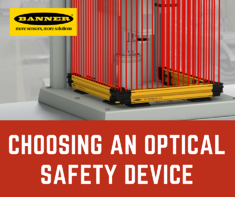 The advantage of having an optical device for such protection is that it can work at very short distances very accurately; therefore, it allows the operator to work without triggering false-alarms. Using a Light Curtain: A safety light curtain involves a sender that emits infrared pulses which are in turn detected by the receiver unit. Interruptions to one or more light beams can then be detected within the sensing field. Safety light curtains provide an ideal solution for point-of-operation problems as they have a slim form-factor, and can be easily mounted close to the hazardous region. In addition, their small resolution allows minute interruptions to be detected such as a hand or a finger, which allows the safety mechanism to be tripped without delay. Using a Laser Scanner: Laser scanners have longer response time, and are therefore not a good fit for this application. Another option instead of a laser scanner in this case would be safety-rated vision system. Whenever choosing a safety technology for such an application, it is wise to consider the minimum safety distance calculation. This is especially important as people are usually working quite close to the point-of-operation machinery, therefore ensuring that the workers remain injury free is vital. However, the device should also be able to let the workers operate in an ergonomic manner, so as not to put a cap on productivity. Area protection and perimeter guarding are quite similar; however, they do tend to part ways at certain points which makes choosing an appropriate safety device for each application easier. Area protection involves safeguarding a hazard point on one side of the machine, especially where the worker would frequently interact with the machine. The person’s presence in the is sensed, and appropriate alarms triggered. Area protection is necessary for machines that have a hazardous area invisible from the position of the reset device. A stop signal is initiated as soon as the area is violated, stopping the machine and preventing any restarts. Common hazard areas include those around automated guided vehicles, stackers and cranes. Perimeter guarding on the other hand refers to safety measures that guard multiple sides of the machine. If any of the sides is breached, then a stop signal is initiated, and the machine cut. Typically, safety laser scanners are used in Area Protection while safety light curtains are used in Perimeter Guarding applications. Using a Light Curtain: As a light curtain is based on a sender/receiver concept, it can be coupled with mirrors to guard multiple sides. If required, one can even mount light curtains very close to the machine to save valuable floor space. Using a Safety Laser Scanner: A safety laser scanner is built upon time-of-flight technology, emitting a pulse that is reflected from a target, if present. The time required for the pulse to travel between the scanner & reflector is proportional to the distance, allowing scanner to detect objects within a defined area. As the scanner has freely defined fields, it can be tucked into the machine for discrete mounting, allowing a particular area to be monitored easily. Once more, minimum safety distance calculations hold paramount importance here. Furthermore, it is important to consider whether hard-guarding or optical-guarding is the better option, depending on the type of hazardous application. Muting is a function that temporarily deactivates the protective function of a protective device. Conventionally, if there aren’t access points covered by hard guarding or doors, muting is used to detect entry/exit. This can be accomplished using two or four muting sensors, such as photoelectric or inductive sensors which are logically evaluated to determine the sequence of the object moving through. If the sequence is correct then the object will be allowed to move through the safety light curtain without putting a halt on the machines’ operations. Using a Light Curtain: A light curtain can be used for safeguarding entry/exit applications by actively differentiating between person & machine. For this application, safety light curtains are arranged horizontally. By analyzing the pattern with which each light beam is interrupted, the light curtain decides whether machines should be halted or not. This is different from muting as no muting sensors are required and the overall mechanical overhead is less. Using a Safety Laser Scanner: Active switching of protective fields is another way to safeguard area’s entry/exit. Safety laser scanners are deployed for this application with vertical protective fields. The appropriate protective field from a series of programmed fields is activated by corresponding signals from the machine controller and sensors. The protective field is designed in such a way that the passage of the object doesn’t trigger an alarm & stoppage of the machinery. Safety light curtains are usually used in entry/exit applications as it is an effective & economical solution. But you may want to use laser scanners instead in situations where space is a constraint.